20% off is better than $10 off! 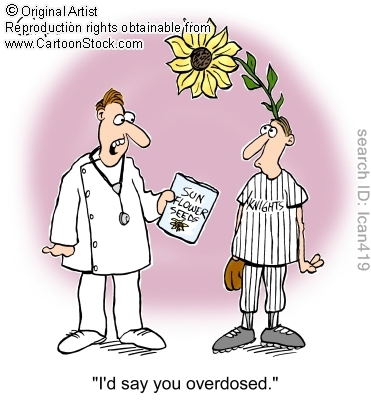 According to the National Sunflower Association, sunflower seeds is the snack of choice in baseball dug-outs. Before, the players used to chew and spit out tobacco, but now they've moved on to the healthier sunflower option. Check out our last blog post for more fun facts about this amazing flower. Last week we were celebrating the pretty and tasty sunflower. The sales continue this week too, but we've decided it's time to up the ante. Now, our discount on the Sunflower Bouquet is 20% rather than $10. That way, people buying the upgraded arrangement of the Sunflower Bouquet will be getting a better deal. The new discount word is tournesols, so enter it in the Coupon Code heading on the billing information page when you order online, OR join Foursquare, like us, and visit our store to unlock the discount. 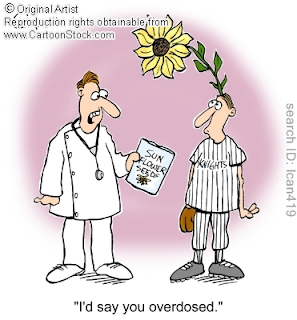 In the meantime, enjoy the sunflower and baseball cartoon. We sure did!